My very favourite record from 2017 tops out of an incredible body of work from Mixmaster Morris Gould, and indeed my pick for greatest album ever in the entire genre of ambient house. Kira Kira is like classic Orb but without the goofiness. I'm so blown away by this record, I may even love it more than anything The Orb put out. Blue My Mind is strangely evocative of Mauriat's Love is Blue orchestration. I wonder if the reference is intentional, or if I'm imagining things. 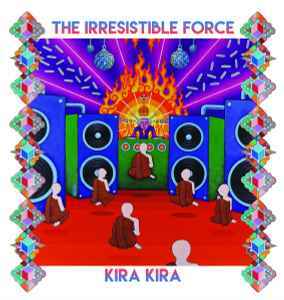 You know, it's heartbreaking when one of your favorite artists returns with a new album after a long hiatus and it falls miserably short of the benchmark set by previous output... Thankfully Kira Kira is no such album, and Mixmaster Morris is no such artist. Thoroughly impressed with this release and to see that he still has it after all these years, and then some. A future classic that matches, and dare I say in some ways surpasses his previous releases. A true living legend! Love this album, had it on repeat the past few days. It is definitely the successor to It's Tomorrow Already. Some could say that makes it sound dated but I think this is timeless. I'm with the other reviewers, LSD where is the double LP version of this? 21st Century classic!! People will be listening to this from space in the future as they look back to Earth... Earthlings need a viny copyl!! The Mixmaster returns. Morris Gould is a well known legend from releasing defining ambient and down-tempo releases in the golden age of Ambient revival on respected labels Ninja Tune, Rising High Records and Fax +49-69/450464, collaborating with the likes of fellow legends Jonah Sharp and Pete Namlook to hosting countless DJ shows with his quality sense of music and mix. For this release Morris has collaborated with Liquid Sound Designs Youth (L.S.D. itself originally being a sister label to important 90s Trance label Dragonfly Records) the result comes out both classic Morris, pleasantly human in touch and a wholesome experience where technology takes a back seat in favor of love. massive ambient chill out dub masterpiece. alltime favourite. vinyl please! very welcome back ambient true spilit. golden age love wrappin this cruel world again. vinyl please! Chillout like only Mixmaster Morris can do it! It's been almost 20 years since his last outing as The Irresistible Force, but he certainly hasn't lost his touch. His trademark kaleidoscopic productions combine with guest appearances from Nik Turner (Hawkwind) on sax, Jah Wobble on bass, and Youth on sparkling production-supervision duties to create something that more than lives up to his legacy -- all chill, no cheese. It's definitely Morris' most organic release, with certain tracks (Laniakea) sounding almost totally live in nature. He still makes great use of cheeky and catchy samples, too, so overall the album feels like a beautiful encapsulation of everything that made and continues to make Morris Gould such a force in electronic and psychedelic music. A total must-have of 2017, and I hope there's still more to come.